It seems the business world is finally realising that service and user experience (UX) design has a strong relevance outside of web and app development – and consequently the last half-decade has seen an increase in companies active in finance, health, automotive, home care, and many other industries, either starting their own in-house UX teams, or alternatively, purchasing existing UX design companies 100% and swallowing them into the company infrastructure. While this brings a valuable approach to the company, it also risks diluting the UX approach within the dominant company culture and limits the exposure of the UX team to developments and talent in the service design world beyond that particular industry. In an attempt to find a third model, Experientia – an international UX and service design agency with offices in Lausanne (CH), Turin (IT) and Singapore – has been exploring alternatives for its future as an independent design consultancy. Now, Intesa Sanpaolo, Italy’s largest banking group, has signed an agreement that gives them a minority share in Experientia. The collaboration will see Experientia working with the Innovation Center of Intesa Sanpaolo on a wide-ranging partnership that will include innovating products and services for both the bank’s customers and its staff. It will also cover collaboration on projects to foster people-centered design within the broader community, with public events on service design and involvement with design school programs. Intesa Sanpaolo through its Innovation Center and Experientia recognize the importance of maintaining entrepreneurial and creative spirit, while sustaining growth and driving innovation. This new model aims to bring the full value of the UX approach to Intesa Sanpaolo, while ensuring that Experientia keeps its ties with projects, clients and inspiration from beyond the banking world, and continues to attract high-caliber talent who can build a varied career portfolio with the consultancy. The partnership has deliberately been structured so that other industrial partners, coming from outside of the financial services sector, are also encouraged to invest in Experientia. For Experientia’s founders (Mark Vanderbeeken, Michele Visciola and Jan-Christoph Zoels), this approach is also a move to combat what they see as the “commoditization” of service design, where people-centered and service design are being positioned in large corporations as something that has a peripheral role and low impact on the business strategy. Intesa Sanpaolo, through its Innovation Center, has long recognized the value of service design for the banking industry, and has previously collaborated with Experientia on a number of projects to introduce a customer-centered approach to its banking services and products. This new partnership is part of a company-wide drive to further stimulate customer-centered innovation within Intesa Sanpaolo, and ensure that future services are strongly targeted to the real behaviors and drivers of its customers. In particular, the projects the two companies have conducted together so far have a strong behavioral modelling approach, exploring ways to help customers to evolve and mature their financial knowledge through products that are targeted specifically at their banking behaviors. Experientia has conducted service design projects that use behavioral modelling techniques in fields ranging across healthcare, automotive, telecommunications, architecture and urban planning, consumer products and the public and social sector. They offer B2B services, as well as conduct projects that research behaviors of customers and end-users and design appropriate service solutions. With offices in Switzerland, Italy and Singapore, the company is an independent consultancy, founded a decade ago. The three founding partners each have over 20 years of expertise in design and people-centered approaches. The company has won several international awards, while closer to home it has been awarded the 2011 Italian national prize for innovation in service design, and inclusion in Italy’s ADI design index in 2014 and 2017. Intesa Sanpaolo is the first banking group in Italy by market capitalization, and second by total assets. It resulted from the merger between Banca Intesa and Sanpaolo IMI and it is based in Torre Intesa Sanpaolo, Turin, Italy. It has 100,000 staff. 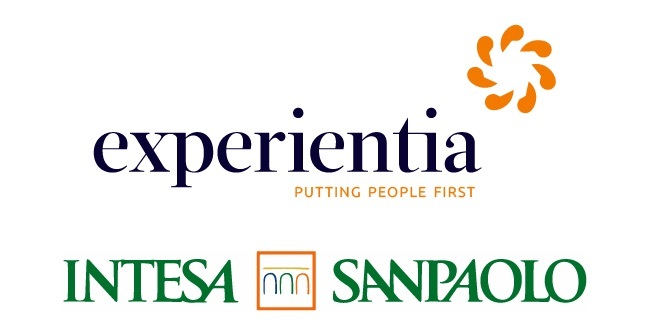 The partnership with Experientia will be run through Intesa Sanpaolo’s Innovation Center. With over 100 team members in Italy, the UK, USA and Israel, the Innovation Center aims to develop projects that create value for the bank’s customers, and for society in general, by helping to simplify banking. It identifies new trends, and transforms new ideas into business service projects. In 2016, the Innovation Center invested around €200 million euro in about 50 projects.